Cedar Rapids, Iowa - Three sports franchises in Cedar Rapids: The Cedar Rapids Kernels, the Cedar Rapids River Kings, and Hawkeye Downs Speedway are excited to announce the creation of a CR Sports Pass for fans to experience all three venues during the 2019 season. 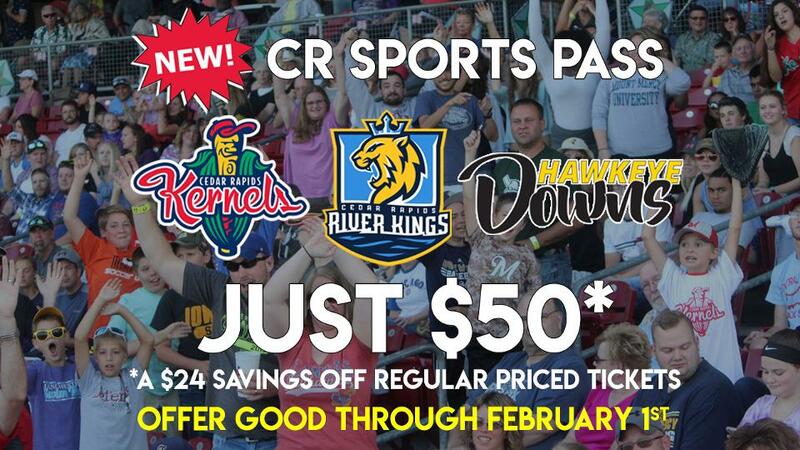 The NEW CR Sports Pass will include two ticket vouchers for a Hawkeye Downs race and a regular season game for both the Kernels and River Kings. "This package will make the perfect holiday gift for the sports fan on your lists that enjoy all the professional sports our community has to offer," says Cedar Rapids Kernels CEO, Doug Nelson. "It's not often you see three different organizations offering different sports-entertainment experiences come together like this, but we believe this shows just how special our community is," said River Kings General Manager Ryan Eucker. The CR Sports Pass will be sold for $50, which is a $24 savings off tickets to these sporting events. Passes can be purchased through each team's front office December 1st through February 1st. "Cedar Rapids is blessed with so many great entertainment opportunities that it seems natural to partner with these two amazing organizations to provide this special offer to our community," said Ann Poe, Executive Director of Hawkeye Downs. Executives from each of these professional sports teams in Cedar Rapids are committed to supporting the sports industry in our community, and plan to work together to promote one another to their prospective fan bases and continue to provide a quality entertainment product for the people of Cedar Rapids and Eastern Iowa.